A recent (UK version) starter question on the quizz show "Who wants to be a Millionaire" asked the contestant to identify the colours of the Romanian flag. 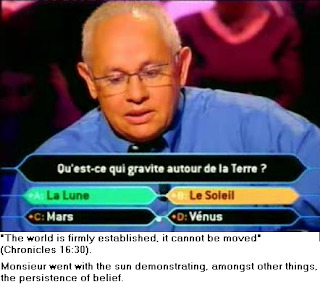 Stumped, the hopeful asked the audience. They plumped in the high 30% range for the right answer and split most of the difference between two other suggestions. A small geographically-challenged 10% minority chose something like fluorescent green. As far as this scribe knows, audience members are not obliged to press a button if they don’t know. Yet over half of them felt the need to say something wrong anyway. Now, the scribe does not want to be the perma-cynic but the more interesting question is how many of the 60 economists surveyed had been sitting on a "shallow dip" forecast since last year. That will surely have driven their responses more than the recent deterioration in the subprime market. Changing one’s mind is more difficult than interpreting awkward facts to match existing prejudices. And of course a "don’t know" answer is generally professional suicide although it ought to reflect the uncertainty of the situation rather than the competence of the speaker. So it appears that, as with the Millionaire contestant who would not trust the wisdom of crowds, most of the WSJ.com survey respondents have chosen to run with another lifeline – the 50/50. An apt presidential candidate, sezme. Well, I will go so far as to concede that "Who wants to be a Millionaire" does not offer its contestants a "Don't Know" option.